A half-hour or one-hour lead capture and/or lead nurturing video webinar. 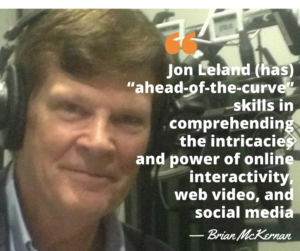 Jon Leland as “emcee”/co-host support for the author/experts (if desired). Package customization available upon request. and co-hosted by Jon Leland. How can this package be customized for you? Click here for a complimentary Discovery Conversation.